Yesterday, Renz and I played the board game Mastermind. 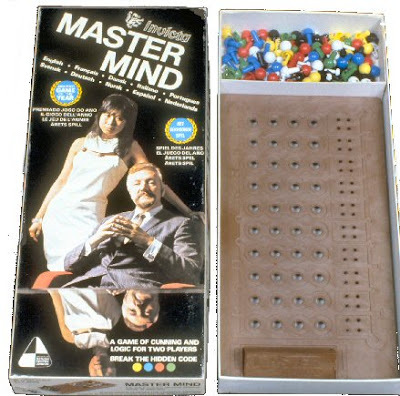 For the young ones out there, Mastermind is a board game that came out and became highly popular in the 70's. As a child, I remember getting excited playing this game then simply because the rules were few and the objective was simple. It's not like chess where each chess piece had its own "rule". No wonder I never got good in chess. Anyway, a few months ago we went out to buy the game. I guess after describing the game and how much I enjoyed it, the kids wanted it too. Frankly I didn't think we'd still find it. After going through SM Southmall's Toy Kingdom and Festival Mall's toy shops, we chanced upon it in MindWorks at Festival Mall for Php400. Here's the box of the Mastermind we bought. It's a bit expensive for a simple game, but the quality of the materials is quite good. The thought of being able to play the game from my childhood once more added to the thrill.